I want to add a supplementary / alternative reason to explain this embarrassment over the text of the Bible. It’s been touched on but not really fleshed out. That is, that these nominal Christians under discussion are all moderns first and Christians second (if second). Worse, they don’t even know they are moderns, or what it means to be a modern, or what modernity is. Rational historicism takes this idea much further and posits a unidirectional progress, which is worked out through impersonal forces (the so-called historical dialectic) over which man may be an unwitting instrument, but which he didn’t design, doesn’t direct, and can’t control. “History” is nonetheless rational, moving “forward” (with occasional, necessary steps back) to ever-“better” states and eventually to an end state in which all dialectical conflicts are resolved, all moral and political problems solved, and final wisdom achieved (if not necessarily accessible to all). In pop-culture terms, the Star Trek universe is basically the cartoon version of this end state. Nearly everyone today believes in this “arc” at least in a simplified way. The present is believed to be inherently more enlightened that the past. We Don’t Do That Anymore Because We Know Better. And the future will be inevitably more enlightened than the present. The source of this impression is ultimately perverted or corrupted or mistaken philosophy, but one does not need to have studied philosophy at all to have been affected, even “convinced.” The astounding success of modern natural science and its offspring, technology, serves to “prove” to such people that “progress” is real and that the present is superior to the past. Technological progress is assumed to be coeval with moral and political progress. But it is never explained why this should be so. Actually, certain modern philosophers did try to make such a case, but they hardly proved it and their case is open to serious theoretical difficulties which have been pointed out by other philosophers. However, that whole dialogue may as well never have happened as far as the average modern person is concerned. He is simply unaware of it and takes on faith that the present is morally superior to the past. This, then, is a significant source of the embarrassment. The modern Christian (modern first, Christian second) is embarrassed by the evident conflicts between his nominal faith and his actual, if unconscious, modernity. Modernity trumps. So the offending Scriptures have to be dealt with one way or another. There are many possible ways: insist that it doesn’t say what it seems to say, come up with Rube Goldberg interpretations to square it with modernity, call it “metaphoric,” say that it was right for that time but not our time, and so on. The latter is a kind of “Living Constitution” framework for the Bible. It assumes that God has left to us the task of “updating” Scripture as the “times change.” The changing of the times is held to be the true constant, and really the true God, but only implicitly. To begin with, Escoffier’s use of the word “moderns” can probably be translated quite accurately into “liberals”, in the sense of the word as I used it in my post The Sound of Inevitability. As for which word is better or more precise/accurate (they aren’t the same thing), I think that is a matter of semantics. Both can work, although for the remainder of this post I will use moderns and modernity instead [the same applies to liberalism and modernism as describing the same over-arching philosophy]. Escoffier is also on the mark when he states that most people “don’t even know they are moderns, or what it means to be a modern, or what modernity is.” Most people adhere to all sorts of philosophical beliefs without realizing it; they lack both the knowledge to categorize their beliefs as well as the introspection to observer them. This double barrier makes it especially difficult to explain to people their own beliefs, as even if you correct their ignorance they might still not get it. All of which means that for most people understanding what they actually believe is probably not feasible. And the list goes on. Now, I’m not sure if modernity was in fact explicitly designed to subvert Christianity. Escoffier might be on the right track here, but whether he is or not determining whether this is the case would take up a post by itself. So I will leave it be for now. The present is believed to be inherently more enlightened that the past. We Don’t Do That Anymore Because We Know Better. Wives required to submit to their husbands? Barbaric. Women not allowed to teach or hold authority over men? Outdated. Women required to cover their head while praying? Oppressive. Women advised to maintain a quiet, gentle spirit? Misogynistic. As far as I can tell, pretty much every part of Scripture (or Tradition) that addresses women in some way is now interpreted through the modernist filter. And that means if it doesn’t agree with modern thinking and beliefs about women, it must be discarded. There are a couple of key points here. The first is that people are embarrassed by what Scripture says. And by people, I mean “Christians.” They really are ashamed of what the Bible has to say about things like marriage, divorce and “the role of women.” Those teachings are incompatible with modernist thought, and in fact scandalous nowadays. To be associated with them is to be a social pariah. As Escoffier points out, modernity trumps Christianity in terms of their values hierarchy. They have either forgotten, ignored or never learned the admonition of Saint Paul: “Do not be conformed to this world.“ No, they have conformed, and in many cases do so with gusto. Ultimately, I think Escoffier is correct when he says that “the changing of the times,” that is, the belief in “Progress”, is the real God of most “Christians”, not the God of Abraham, of Isaac and of Jacob. They do not keep the Great Commandment and “love the Lord your God with all your heart, and with all your soul, and with all your might.” (Deut 6:4-5). It is the world, and its empty philosophy, that they truly love. Update: Novaseeker has created a post highlighting Escoffier’s comment, and Dalrock has created his own post as well. This post is going to going to be a departure from my normal fare. Today I am going to dip my toe, however tentatively, into that murky pool of forbidden knowledge known as Neo-Reaction, or what some have deemed “The Dark Enlightenment.” Looking back over it, I realize this is a sloppy post, and I apologize for that. Its been difficult to compile and organize my thoughts on this subject and I may not repeat it. But enough of that, on to the actual post. This social order developed organically over time, although philosophy and theology later came to ratify its existence. Those elements of society outside the power structure were known as the Fourth Estate. This era was marked by a consolidation of economic and political power together under the nobility. As the economy was primarily agricultural, land equaled wealth. Since the nobility controlled nearly all the land, they largely controlled the economy. Merchants who amassed significant wealth through trade were few and far between, and in many instances the nobility took steps to restrict this development. The clergy were held to be the first estate because they received their authority from God. The nobility, which received their authority from the clergy, were the Second Estate. And finally came the final, Third Estate, the commoners, who received whatever rights and authority they had from the nobility. Each of the Estates played an important role in the social order, one that their simple descriptions doesn’t do justice. The First Estate, the clergy, did more than just pray. In fact, a better descriptor of them would be “those who preach.” For it is preaching, not praying, that gave them the power they wielded in European society at the time. They provided the moral authority and framework for the entire feudal system; in essence they set the rules of the game. The nobility did fight, a lot, although the petty nature of much of it has long made me think that they should have been called “those who squabble”. However, they also ruled too, and that was the greater part of their role in medieval society. It was the nobility’s governance over the commoners which marked their primary role in the system. Only the description of the commoners is accurate; they really were “those who work.” The commoners were the backbone of the system, driving the primarily agricultural economy and supporting the existence of the other two Estates. The key thing to understand about the Estates of the Realm is the way the Estates interacted. The clergy used their influence to provide moral authority for the nobility to rule over the commoners. In essence, they instructed the commoners to follow the nobles. In return the clergy received special rights and exemptions from most of the noble’s governance. They clergy had their own lands, their own court system, and were in many respects independent of the nobility. The nobility used the moral authority they were granted to rule over the commoners. And the commoners provided material support to the other estates. I should point out that the symbiotic relationship between the First and Second Estates was not entirely peaceful. In fact, there was a constant struggle between them over the centuries. This is because their interests were close, but didn’t line up perfectly. At the heart of this conflict, at least in Western Europe, was the question of who was supreme: the King or the Pope? Over time, this struggle escalated, and was encouraged by divisions within the First Estate. The Reformation was as much a fight between the First and Second Estates as it was a fight within the First Estate. This brings us to the present day. What I believe we are witnessing now in the United States and in most of Western Civilization is the development of a social order that bears a striking similarity to the Estates of the Realm. 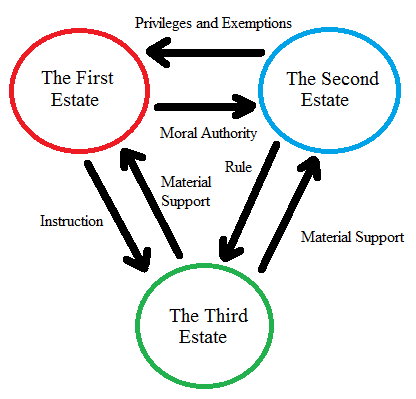 Remember, the core architecture of the “Three Estates” is that you have one Estate/caste which defines the moral order and is largely independent, you have one Estate/caste which rules the commoners and exercises political, economic and military control, and then you have one Estate/caste which is basically everyone else. Already this new First Estate is being exempted from laws that affect the Third Estate. They receive other protections as well, including greater “free speech” rights and special tax rules. Meanwhile, the Second Estate that is developing is composed of political elites and high level government bureaucrats at the upper echelons, while law enforcement and lower level bureaucrats fill up the lower ranks. These are the segments of society who are assuming the same kind of power and authority that the nobility once had. Also, it is more than simply the State, as it includes party leaders and activists. You can see this in the US through the greater amount of control over the economy that the Federal Government is assuming every day. “Obamacare”, which constituted a massive government intervention and involvement in large sector of the economy, is one example of this. The purpose of these laws, the true purpose, is to assume for government greater power over the economy. This is because the centralization of political and economic power is an essential component of the Second Estate asserting itself and ruling over the general populace. While the US military might be weakening, law enforcement in the country is increasingly militarizing. This process is not accidental- while there are some justifications for these measures, they also pave the wave for law enforcement to more easily squash domestic opposition, something which is not lost on those who form the new Second Estate. The Third Estate hasn’t changed much since then. It is composed of ordinary individuals who are trying to get by in life. It exists now mostly as a tax base to support the other two Estates. If you look back up to the graphic above depicting how the system worked, you can see that it hasn’t changed a bit. Each segment of society has its role to play. Now, this social order is still emerging, and hasn’t yet fixed itself in place. But the process is well advanced now. Those who dislike the present US administration likely appreciate this, although I suspect few realize just how much the present US President is a creature of the current First Estate. They built him up and launched him into place in order to carry out their goals. And thus far, they have largely succeeded. The Church, in a very broad sense encompassing all Christian faith traditions, has lost so much influence and authority in the West that it is effectively no longer in the game. The old First Estate is largely broken. In fact many faith traditions have essentially been wholly taken over by the present First Estate, and now serve its interests. As for the Second Estate, different political factions all operate within the system and accept its rules- their conflict is akin to the nobles of the past fighting over land and title. There is no fundamental disagreement over the propriety of the system, only a squabble over who controls the system and thus gets to divvy up the spoils. This all brings us to the Fourth Estate. The press is no longer in this position, instead it has displaced the Church and assumed moral authority over society. If there is any part of society which can be considered to compose a present Fourth Estate, I would have to think it would be the few remaining intact Christian faith traditions coupled with the philosophers and polemicists in the Neo-Reactionary movement. Only there do you find any real opposition to the present order, and even there it is stronger in the latter than the former. Only Traditional Catholics, the Orthodox Church and certain isolated Protestant churches can be considered to be in opposition to the present order. The others have either compromised with it, accepted it or embraced it.